LIVERPOOL endured another frustrating day in the English Premier League, wasting a number of chances in a 1-1 draw at Newcastle. Manager Jurgen Klopp said he was "disappointed and frustrated” after his side failed to take advantage of lead given to it following a sublime goal from Philippe Coutinho. 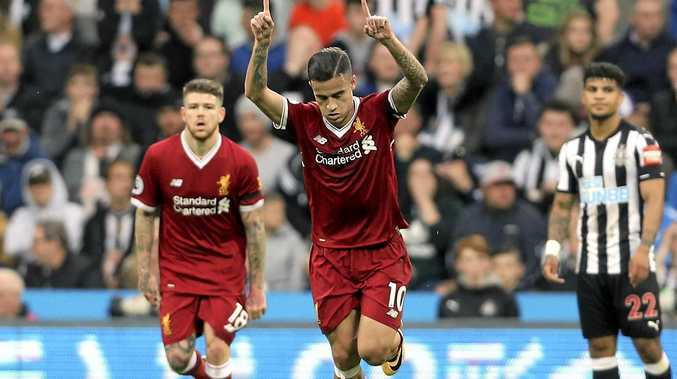 The Brazilian smashed home a 30-yeard effort before the half-hour mark but the Reds allowed Newcastle to equalise through Joselu with what turned out to be the home side's only clear attempt on goal. Victory would have seen Liverpool leapfrog champions Chelsea into fourth place. But instead Klopp's men go into the international break in seventh spot. "I am disappointed, frustrated, whatever you want,” Klopp told the BBC. "They (Newcastle) got one chance and scored. That doesn't feel too fair. A 1-0 win by Burnley over Everton at Goodison Park piled the pressure on big-spending manager Ronald Koeman, whose team has now won just twice in seven league matches to sit just two points above the relegation zone. Jeff Hendrick crowned an excellent team move in the 21st minute to score the only goal of the game. Arsenal, meanwhile, marked the 21st anniversary of Arsene Wenger's appointment as manager with a 2-0 success at home to Brighton. Nacho Monreal's 16th-minute goal gave Arsenal the lead at the Emirates before Alex Iwobi's second-half strike secured all three points for the Gunners.